Home › Updates › Lots to Celebrate! The holiday weekend ahead promises fine New Hampshire weather and lots of celebrations throughout the state. What a sweet time of year: the bright, warm days of late summer and the finest summer bounty from area farms and food producers, all available right here at the Tilton Farmers’ Market. We’re open Fridays, from 3 to 7 p.m., and we’re conveniently located at the Tanger Outlet Center in Tilton, New Hampshire. Whether you live right down the street, or you’re heading through town on your way to a relaxing vacation spot, you’ll find us here ready to fill your bags with great stuff! How’s that for positive support of our growing food system? Governor Hassan visited the market, along with New Hampshire Commissioner of Agriculture Lorraine Merrill and USDA Farm Service Agency, State Executive Director, Jay Phinizy. The prime sponsors of the SB 141 were Martha Fuller Clark, Tara Sad and John Reagan. Many other State of NH dignitaries also attended. 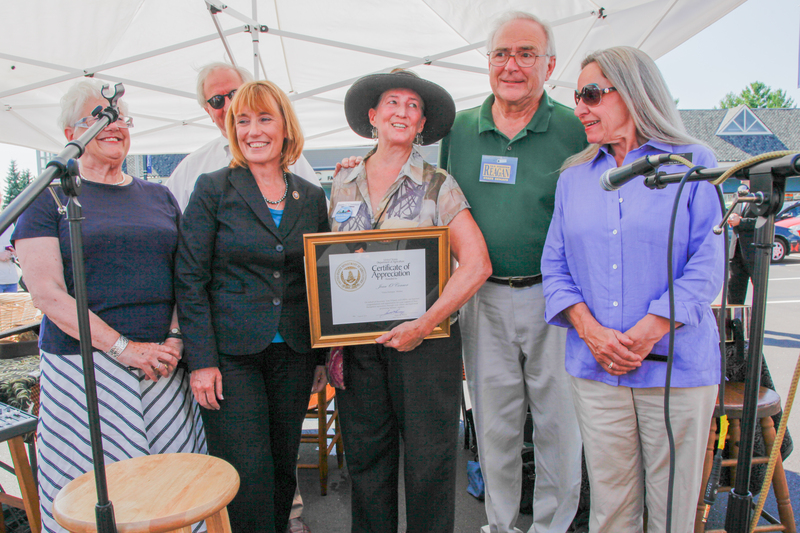 At that event, our own Market Manager Joan O’Connor was presented with a United States Department of Agriculture Certificate of Appreciation for her years of work in support of New Hampshire farmers markets. Congratulations, Joan! Celebrate summer by stopping by the Tilton Farmers’ Market. See you at the market! ‹ Summer Doesn’t Get Any Better!